I love the fact that we can witness planetary geology from the garden. 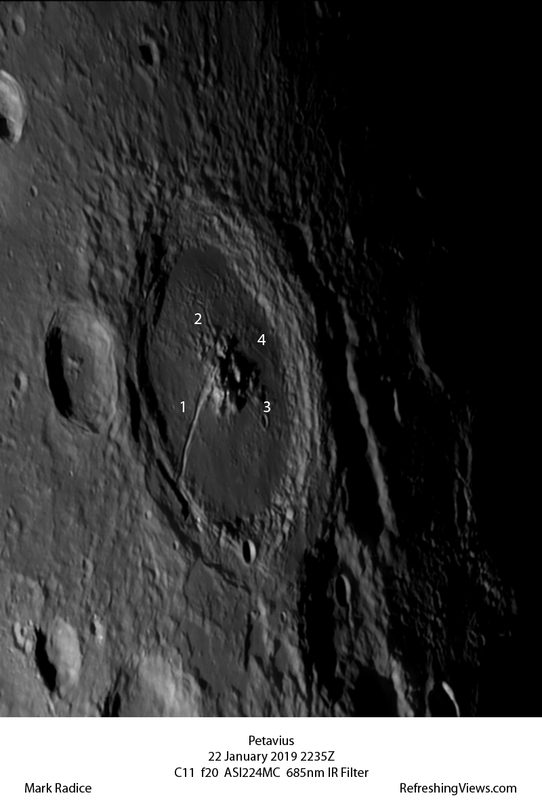 The lunar crater Petavius (dia 177km) is a beauty through the C11. It has 4 rilles (see labels) on its floor that hint at a pool of magma that is trapped below the surface and, in addition to the rilles, caused the southern rim to collapse leading to its double rampart. Note that the southern part of the crater floor is relatively smooth compared to the northern floor, again hinting that it has suffered from a volcanic outflow, albeit limited. All this with a cup of tea in hand and the radio on!